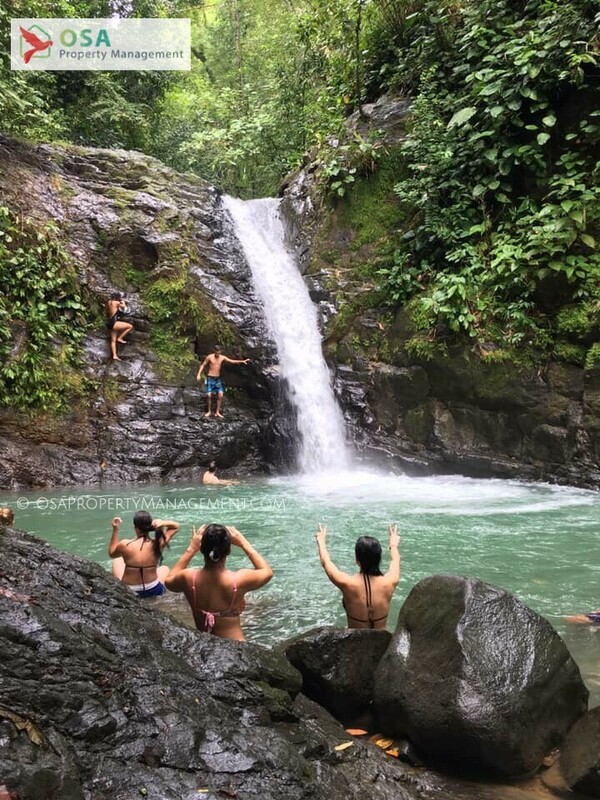 Costa Rica, and in particular the Bahia Ballena region, has many beautiful waterfalls. In fact, although there are several well known waterfalls within a short drive or walk from where we live, we are now just beginning to go explore them. 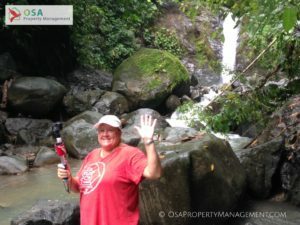 Recently we were invited by Abigail Vargas, of Osa Property Management, to go and visit the Uvita Waterfall. Neither Lisa nor I knew where exactly this waterfall was, but when I asked Abigail what the official name of the waterfall was she said,"Uvita Waterfall. Everyone simply calls it that." Ok! 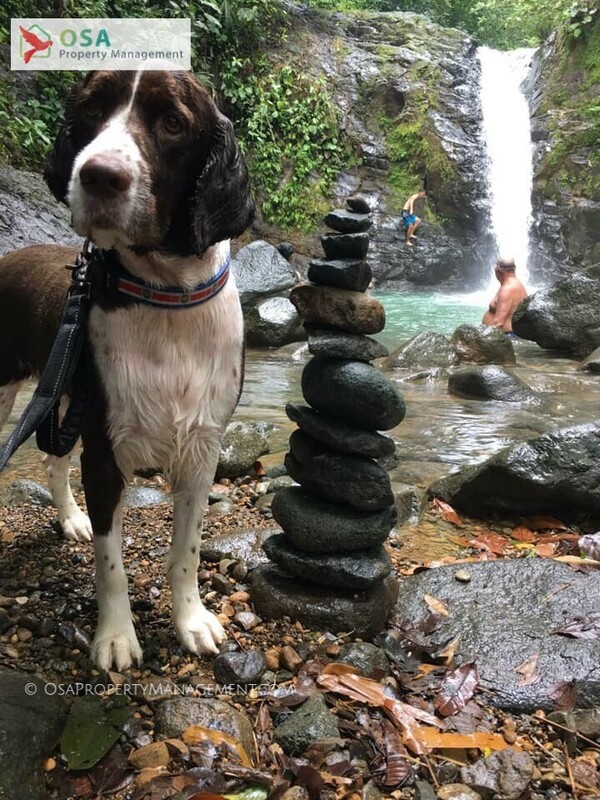 Let's go to the Uvita Waterfall! I've only seen one other waterfall in-person in my life, so I'm hardly an expert, but the sound, the power and the majestic beauty of them is amazing. Based on Abigail's recommendation, arriving earlier in the day is advised due to the smaller crowds, so we met at 9 am in the parking lot. By "we" I mean myself, Lisa, our amazing Springer Spaniel 'Whiskey', Abigail and Abigail's four year-old son. We paid our admission fee of 1,000 colones ($1.70) per adult and kids are free (Whiskey was also free) and started walking to the waterfall. We followed the cut-out path through the jungle for a couple of minutes, and with each step the roar of the Uvita Waterfall got louder, before arriving. Luckily for us, when we arrived, there was only one other couple there. This is the height of the rainy season so most creeks and waterfalls are flowing to capacity and are dangerous to swim in. However, although Uvita Waterfall was flowing powerfully, the pool below was calm and enjoyable to swim in. Lisa brought her GoPro video camera to capture some of our fun during the day (check out video below or click here). Whiskey ran and enjoyed the cool water. Abigail was a bit more daring than Lisa and I were...Abigail swam in the natural pool below the falls and jumped off a ledge about three feet over the water. There were other people (the Columbian's) who even climbed higher up the rocks to jump into the water. When I was a younger man I would have definitely climbed up some rocks and jumped in. As the day drew on Uvita Waterfall became a melting pot of people including locals, Columbians and Germans. This is very typical of the Bahia Ballena region of Costa Rica - a healthy and fun mix of locals and ex-pats enjoying each other's company. Not knowing Spanish had zero impact on our day and the few times I wanted to say something, and the facial expressions and exaggerated arm gestures didn't work, Abigail translated for us. Having Whiskey (the dog...) with us helped break the ice too, as everyone loves a friendly and happy dog running through and splashing in the water. We were all eager to meet each other and learn from each other. This just does not happen in the United States too often. By the way, the pictures don't to the waterfall justice. The roar of the water and surprisingly, the entire day was bug free. So if you get the chance, talk to Abigail from Osa Property Management or look us up in San Buenas. 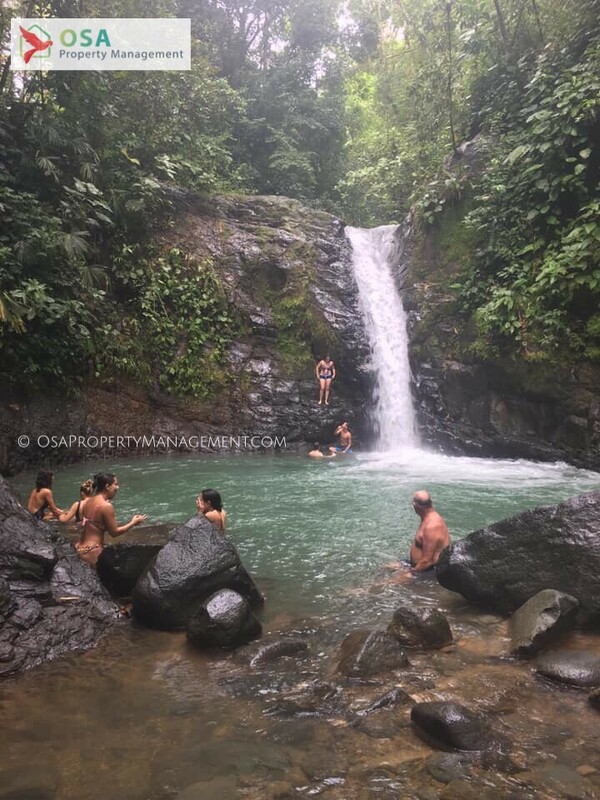 We would be more than happy to show you Uvita Waterfall (really, that's the official name) and other amazing places nearby!! Pura vida!! 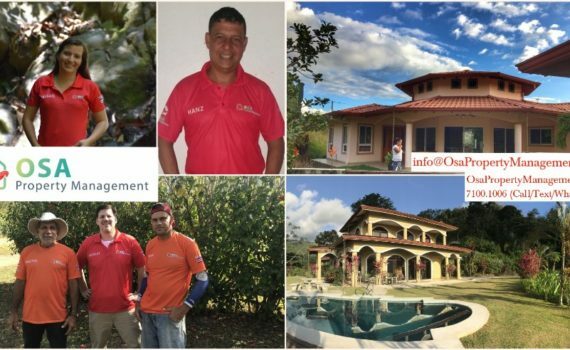 Osa Property Management is proud to announce we are officially launching Property Management Bahia Ballena region. We have been working behind the scenes for over 18 months working out our processes, working with home owners and service providers to ensure that our customers receive the best service in the area. 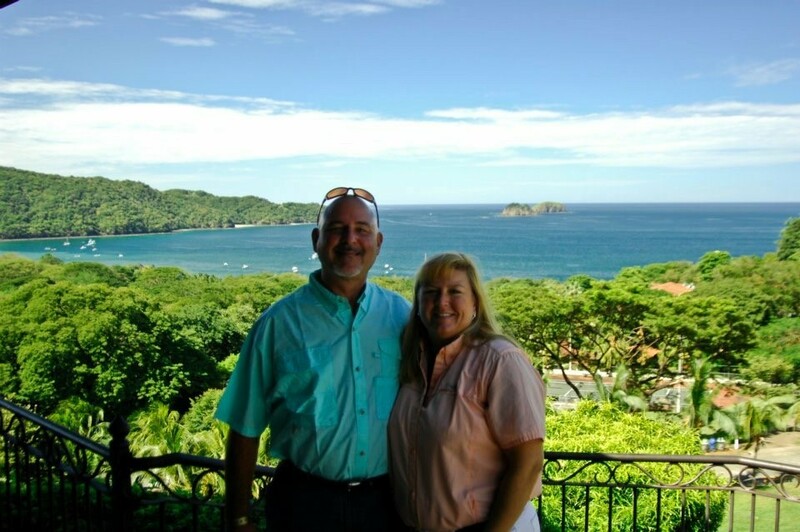 Additionally, Nick Halverson and Hanz Cruz have been working for almost 10 years managing property at Las Villas de San Buenas. We also offer personalized custom service. Osa Property Management will also help show you around the area and help you with any services you may need. Clients have asked us to help them open bank accounts, to schedule a doctor's appointment and to provide private tours for families. 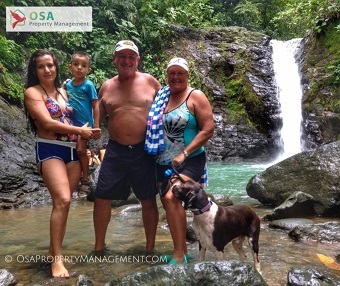 Everyone at Osa Property Management is dedicated to ensure our clients' experience with owning real estate, and living, in the Bahia Ballena is as easy and enjoyable as possible. Let us come out and provide a no-obligation offer bid for your home or your lot for Bahia Ballena Property Management. With a combined experience of over 25 years in property management services in the region, Osa Property Management is the most experienced company in the area. Be sure to visit our YouTube channel that provides great information about the Bahia Ballena region. We regularly update our videos with activities, as well as, newsworthy events taking place in the area. Below is a video about a potential new international airport that would benefit homeowners and visitors to the Bahia Ballena region.